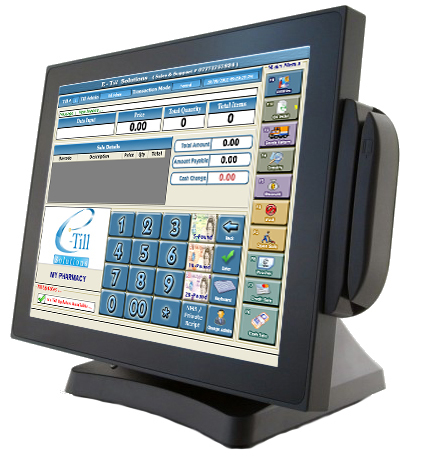 E-Till Epos System that is specially designed for pharmacy stores, it covers A to Z requirements of a pharmacy store. Empowered with unique features specially required for medicine retail business, it stands apart from other general Accounting & Inventory software available in the market. 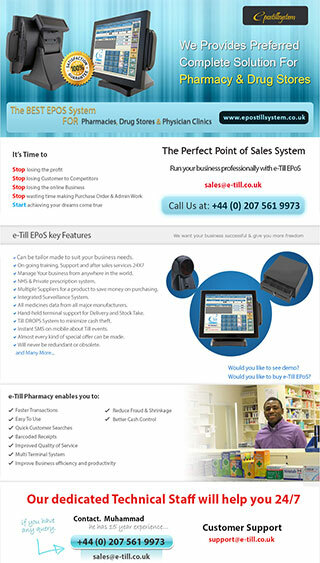 Sales are the most important part of pharmacy business and so they come from customers, so EPOS systems should streamline the customer experience to make it as hassle free and pleasant as possible, E-Till Epos System has developed EPOS System in this way. NHS (Exempted & Paid) and Private Prescription. Any Kind of Special Offer / Promotion System. Cash & Credit Card Mix Payment Option With Integrated Credit Card Machine. Product Price Increase at specific Time/Date. Updated with the latest products information from all Major Manufacturers. Age Restriction for Age specific Products. Automatic Product Add Through Till Scanning. Goods Return with Cash / Credit Card / Voucher Option. Till Floats can be controlled from Back Office. Cash, Credit Card, Vouchers and even specific Products Details Provided on Z-Reading. Customer Product Request directly from E-Till. Store & Shelf Product Stock Handling. Intelligent Purchase Order that can save lot of money while purchasing a product that has more then one suppliers. Video Clips for every Sale, Goods Return, Till Drops, D-Reading, X-Reading & Z-Reading. Camera Playback with Date and Time range Search Option for all Cameras. Employee Clock IN / OUT.